This was an event we were really looking forward to. Poet Kiriti Sengupta was travelling to Delhi for the launch of the expanded second edition of his book My Glass of Wine. 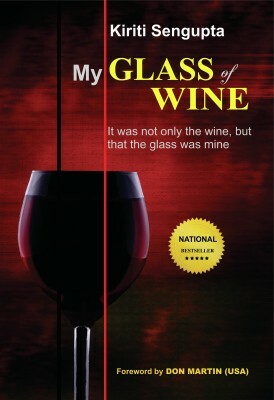 The first edition of My Glass of Wine was declared a bestseller within a month from its release in February, 2014. The book has been widely reviewed and appreciated in literary journals both in India and in the United States. It has been inducted into the Ryerss Museum & Library (Philadelphia, USA). Hawakaal Publishers, Kolkata, have published an expanded second edition that has been a bestselling title in the United States ever since its release on Amazon on August 18. Kiriti Sengupta is a bilingual poet and translator in both Bengali and English. He is the author of three bestselling titles, My Glass Of Wine, a novelette based on autobiographic poetry, The Reverse Tree, a nonfictional memoir, and Healing Waters Floating Lamps [Poetry]. Kiriti’s other works include: My Dazzling Bards [literary critique], The Reciting Pens [interviews of three published Bengali poets along with translations of a few of their poems], The Unheard I [literary nonfiction], Desirous Water [poems by SumitaNandy, contributed as the translator], and Poem Continuous – Reincarnated Expressions [poems by Bibhas Roy Chowdhury, contributed as the translator]. Sengupta has also co-edited three anthologies: Scaling Heights, Jora Sanko – The Joined Bridge, and Epitaphs. Hawakaal (pronounced as Hawa Kol) Publisher has been founded by Bitan Chakraborty more than seven years back. They made their foray into the English language publications through Rhapsodies and Musings, a book of literary criticism, authored by Ketaki Datta and Tania Chakravertty. Other books by the publisher include the expanded second edition of My Glass of Wine by Kiriti Sengupta and Poem Continuous by Bibhas Roy Chowdhury (to be launched on September 28). We had organized the launch of his book at Oxford Bookstore, Connaught Place, New Delhi. Along with launching the book, we had also decided to open the stage up for aspiring writers and young poets who are already making a mark on the world of Indian poetry. It was a two-hour-long event and here is a brief round up of it. The book was launched by eminent poet, scholar, and writer Dr Sukrita Paul Kumar, Prof. Chandra Shekhar Dubey, Kiriti Sengupta, and Vibha Malhotra. In her talk about My Glass of Wine, Sukrita ji spoke about hybridization in culture and language. She also applauded Kiriti Sengupta for his use of alaap in his book. Professor Dubey spoke about the inherent spirituality in My Glass of Wine and also about the title of the book. Sukrita Paul Kumar was born and brought up in Kenya and at present she lives in Delhi, writing poetry, researching and teaching literature. An Honorary Fellow of International Writing Programme, University of Iowa (USA) and a former Fellow of the Indian Institute of Advanced Study, Shimla, she was also an invited poet in residence at Hong Kong Baptist University. She has published five collections of poems in English including Rowing Together, Without Margins and Folds of Silence. Sukrita’s major critical works include Narrating Partition, Conversations on Modernism, The New Story and Man, Woman and Androgyny. Some of her co-edited books are Ismat, Her Life, Her Times,Interpreting Homes in South Asian Literature and Women’s Studies in India: Contours of Change. As Director of a UNESCO project on “The Culture of Peace”, she edited Mapping Memories, a volume of Urdu short stories from India and Pakistan. She has two books of translations, Stories of Joginder Paul and the novel Sleepwalkers. She is the chief editor of the book on Cultural Diversity in India published by Macmillan India and prescribed by the University of Delhi. A recipient of many prestigious fellowships and residencies, Sukrita has lectured at many universities in India and abroad. A solo exhibition of her paintings was held at AIFACS, Delhi. A number of Sukrita’s poems have emerged from her experience of working with homeless people. Chandra Shekhar Dubey is a poet, writer, translator and Associate Professor in the Department of English, Shaheed Bhagat Singh Evening College. He has publised three collection of poems titled Ripples On A Stone(Writer’s Workshop, Kolkata, 1994), Substance of Shadows (Swati Publication, New Delhi, 2007), and Real Resonance – The Unreal Mind (Shambhabi, Kolkata, 2015). His poems, research papers, reviews, short stories and translations have been published in many national and internal journals of repute. His doctoral dissertation abstract was published in Gissing Journal, Bradford, England, 1994. His book, George Gissing: An Apostle of New Morality, was published by Common Wealth Publishers, New Delhi, 1996. He edited the translated version of The Ramcharitmanas with Romanization, a project of Mauritius Government published by Richa Publication, New Delhi, 1999. He worked in interdisciplinary innovation projects of University of Delhi, as co-investigator and mentor. He has been featured in My Dazzling Bards, a book of literary critical analysis written by Kiriti Sengupta, and published by The Poetry Society of India, Gurgaon. His poems have been widely anthologized in several anthologies published from India, Australia, Canada, and the United States. This was followed by a short discussion between Kiriti Sengupta and Vibha Malhotra, founder of Literature Studio. They discussed hybrid literature and the publishing scenario, apart from My Glass of Wine. Next came the first round of readings. Six winners of the My Glass of Wine creative writing contest were invited to read their works. Their winning entries were compiled into an anthology called Sankarak – A Literary Fusion and the book was unveiled on the same stage. Aashutosh Mukherjee studies in eighth grade in Delhi, and he loves to write and draw. He likes reading short stories in particular. Besides reading, writing, and drawing, jis hobbies include music and sports as well. He will present his short hybrid memoir Dida’s Schooling, which is a fusion of prose and pencil drawings. Esha Chakraborty is an avid reader and a writer. She has two full time jobs. One of course is her 9-5 job and the other and more exciting is being a mom to her 2-year old. Her short stories have been published in anthologies. She blogs at https://bookhippo.wordpress.com/. Her story The Stone Hearted Husband fuses fiction and poetry. Radhika Maira Tabrez is a hustling mother by day and a writer by night. When she isn’t dancing to the tunes of her three-year-old son, or experimenting in the kitchen for her husband, she loves to read, watch movies, and engage in DIY home décor projects. Her writings regularly feature on Readomania.com and her own Facebook Page : ‘Just a thought – By Radhika Maira Tabrez’. One of her stories, “Jaanaki Kaaki”, was recently published in UnBound (an FWBA eMagazine)’s first edition, and received rave reviews for the unusual treatment of the theme of “Freedom”. Another story is soon going to be a part of a print Anthology to be released by Readomania sometime later in 2015. Her story Tiny Drops of Grace is a fusion of fiction, songs, and verse. Raghav Arora was born and brought up in Rishikesh, near the holy banks of river Ganga. The holiness and spirituality of his hometown has had an inscribing effect in his life and writings. He lives there with his mother, aunts and grandparents who are pious people and always bent upon making him a God fearing fellow. This 25 year old lad is an engineer by profession but he quit it upon realizing that only writing would quench his thirst. He’s a wanderer and a believer that he’ll find his truth in his own written words gradually. He’s a big fan of astronomy, physics, metaphysics and mythology. He likes fiction and poetry. Jhumpa Lahiri and Salman Rushdie are his favourite. He loves playing flute and sometimes tries his hands on percussion. He loves the Himalayas. In his story That Precise Moment! he fuses fiction and verse. Tanmoy Bhattacharjee is a postgraduate scholar of English Literature. He teaches English in a High school and writes English poetry. Previously, a feature writer with a local English daily, Tanmoy hails from Raiganj, West Bengal, India. Besides, he is regularly published in some nationally reputed journals and webzines like Asian Signature, The Contour, The Literary Herald, etc. Recently he has contributed his poem for the International Charitable Anthology Magnitude: The Awakening of Nepal. Known as ‘The Curly Poet’ and honoured with the title of ‘Most Popular’ at Delhi University where he studied English literature, Nitin Soni is a poet, storyteller, script writer & social activist whose writings have appeared in many national and international publications. Moreover, he was one of the youngest speakers at Odisha Literature Festival in 2015. Raghavendra Madhu is poet, epigrammatist and the founder of Poetry Couture, a pro-bono initiative running across Delhi, Mumbai, Chennai and Kolkata which engages writers in poetry and prose readings. It has created many (free) art spaces for poetry in these cities. He has read at the American Consulate, Delhi and Chennai and at the National Gallery of Modern Arts, New Delhi. He has been invited to take part in the Prakriti poetry festival 2015 at Chennai. He is beginning his journey as an art curator with his new venture Po Art Initiative which aims to amalgamate and promote various art forms like literary works, short films and music. Tanya Chaudhary is a PR Executive by profession and a dreamer by heart. Like Dorothy Parker, she too believe in the adage – “Travel, trouble, music, art, a kiss, a frock, a rhyme. I never said they feed my heart, by they still pass my time”. She started writing poetry, when she wasn’t too sure about anything. When she was in a process of unloving someone and in a stage of falling in love with words. Like every other person she loves music and movies. The only difference is that she lives it too. For her, the concept of reality and fiction is pretty overrated. Likes everything bizarre and eccentric. Fun Fact – she can’t sleep at night without watching a movie and wishes that the Director Jean Luc Godard would picturize her life. Her favorite movie is Vivre Sa Vie. Oh yeah, also, Irony is her best friend. You can read her poetry on Facebook at Tanya C Poetry. Yaseen Anwer is a polyglot Indian poet. He founded ‘Kaafiya: The Poetry Festival’ in the year 2015, and also is acting as Kaafiya Festival Director. He is the Founder of Poets Corner Group, conceptualized in the year 2011, and Co-founder of Delhi Poetry Festival, in the year 2013. He is an engineering drop out by choice. Felicitated with “Young Poet Award 2012” by the Indian Poetry Society, his translated work can be found and read in Chinese, Portuguese, Hindi, and a few other languages. As a literary benefactor, he has chaired several sessions as a speaker/ feature poet/ moderator/guest speaker/guest poet at premier educational institutions and literary festivals. His work has been published in more than 70 national and international Magazines & Journals. Besides writing, photography and digital imaging are the other two fields of his interest. The event ended with prizes for My Glass of Wine creative writing contest. Esha Chakraborty won the special prize from Kiriti Sengupta. Arvind Passey and Tanmoy Bhattacharjee won gift hampers from Tathya. Radhika Maira Tabrez and Aashutosh Mukherjee won creative writing courses worth Rs 10,000 from Literature Studio. Raghav Arora won a book deal with Hawakaal Publishers. Ashmi Ahluwalia is the Poetry Editor at Literature Studio’s Readers’ Corner. She is a poet and enjoys indulging in the world of rhyme when not doing business development in her day job. After completing her graduate education in English Literature at St. Stephen’s College, she did her Masters’ degree in Media and Communications from the London School of Economics and Political Science (LSE). Passionate about her cocker spaniel, dessert, writing and soft rock; she has edited a compilation of Indian-English poetry called Writing Love (Published by Rupa, August 2010). And now a word about our sponsors Travelling Camera and Tathya. Travelling Camera was our photography partners and Tathya sponsored gifts for our winners. Travelling Camera is a blog that specializes in photo stories. They specialize in travel, hotel and restaurant reviews, event coverage, and personal photo stories. Tathya literally means ‘fact.’ And the fact is that we love doing illustrations and love quirky products. Ideation for Tathya began in 2009. Their products include wall art, mugs, notebooks, and t-shirts. I’m grateful to Literature Studio for managing the event successfully in Oxford Bookstore, Connaught Place, New Delhi. Heartfelt thanks to my publisher (Hawakaal Publishers), Ashmi, Sukrita-ji, Dubey-ji, and to the sponsors of the event. A well organised and scintillating event . I feel humbled and gratified by the sense of warmth and hospitality extended by the organizers led by Vibha MalHotra and her team.Speaking on Kirti da’s book was my pleasure.